Many homes these days have sliding glass doors. 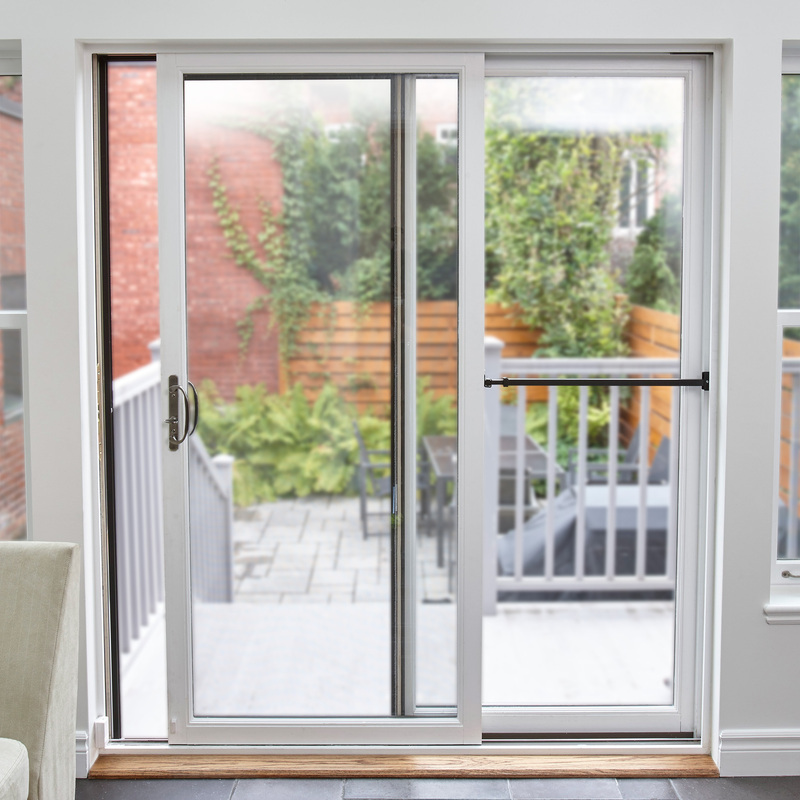 These doors let in lots of natural light and make it easy to get outside to your backyard, deck, or balcony. The downside of sliding glass doors is the ease of access to your home that they provide to unwanted intruders who may want to enter your home. Sliding doors come equipped with small latches that hook onto a piece of metal in the door’s frame. These latches are generally operated by moving a small lever and are extremely easy to open. Therefore, the locks on sliding glass doors simply cannot offer the high level of security that a good deadbolt lock does. Sliding glass doors operate on tracks instead of hinges. As a result, it is very easy for thieves to remove them. Often, it is a simple maneuver with a crowbar and the door is lifted off the track. One of the most desirable features of sliding glass doors is also one of its biggest weaknesses. The large, single plates of tempered glass are easily broken. Tempered glass is specially treated so that when it breaks, it doesn’t break into big dangerously sharp pieces. Tempered glass shatters into tiny pieces that don’t have sharp edges, so it is easy for an intruder to enter through the broken glass without getting hurt. The View is Great – From the Outside. Sliding glass doors do let in a lot of light, which is a feature many people like. However, they also create a great view from the outside into your home. This allows would-be thieves to see exactly what you have inside and can help them decide if they should target your home. Many sliding doors are placed in the back or side of the house where a patio or deck would be located. Therefore, they may not be visible from the street. In addition, many people put landscaping or fences near them for privacy. Unfortunately, these items can prevent helpful neighbors from seeing when someone is trying to get in. Combine Ideal Security’s SK808BL Flush Mount Handle Set with Ideal’s SK807 Locking Cylinder. In addition to giving you the ability to lock and unlock your sliding doors from the outside, the SK807 lock offers better security than the standard sliding door lock. Ideal’s Patio Door Security Bar with Anti-Lift Lock is a convenient hinged bar that will prevent the door from sliding open when in the horizontal position. There are also locks that can be attached at the top or bottom of the door. These key-operated locks have pins that slide into the floor or upper door frame and keep the door from sliding, even if the primary door lock is breached. Double bolt locks are also effective. There are special one-way film sheets that can be applied to the glass of your sliding doors that allow you to look out, but won’t let outsiders look in. Outside, people see a mirrored finish. Bear in mind, though, that these films are only effective during daylight hours, so you still need to draw curtains or blinds after dark. Put in Laminated or Impact Glass. Laminated glass is made by fusing a special PVB sheet between multiple pieces of glass. Someone can break the glass, but the PVB sheet inside will remain intact, so the glass will not fall out of the window. The only way to continue to break in is to cut the film. This adds an extra step to the burglary (and the need for an additional tool), so it should discourage a burglar from continuing to try to enter your home. Impact-resistant glass is designed to withstand hurricane force winds throwing heavy objects at your windows, so it is extremely difficult to break. Home safety and security is not something to be taken lightly. So, don’t hesitate to seek the help of professionals! Ideal Security offers a full line of door and window hardware and security tools. Let a licensed locksmith help you choose and install the right locks for your doors and windows. The techniques shared above will only work if they are done right!